Starting today, we’re providing an easy way for our customers to share and crowdsource treatments they use to manage common health conditions, like depression, asthma, ADHD and migraine. All 23andMe Health + Ancestry service customers will be able to learn about the effectiveness and popularity of hundreds of different treatments for common conditions — and will also be able to contribute their own personal experiences. 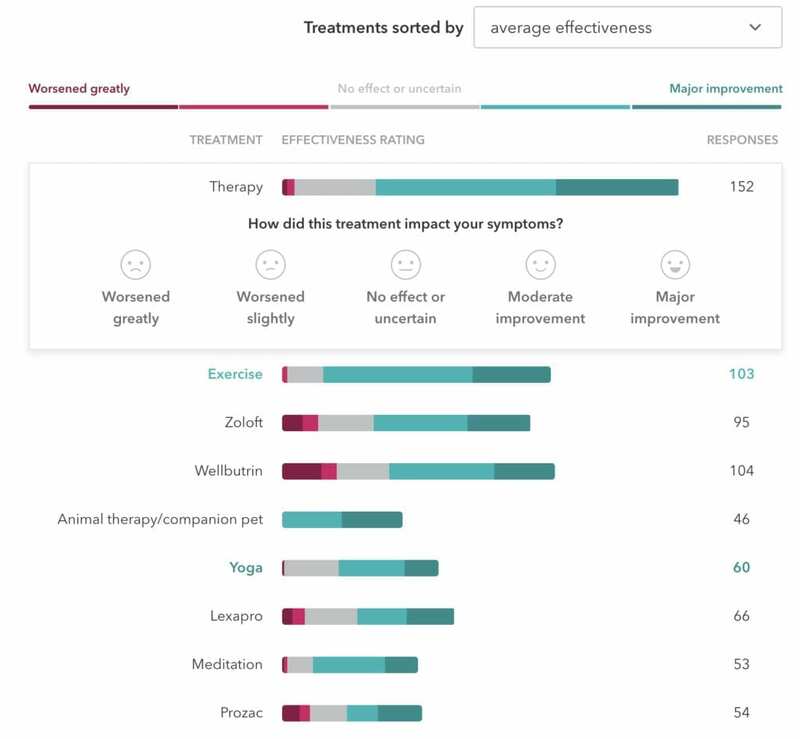 Crowdsourced treatment ratings are just one facet of our new Condition Pages, which contain database insights on 18 common health conditions. 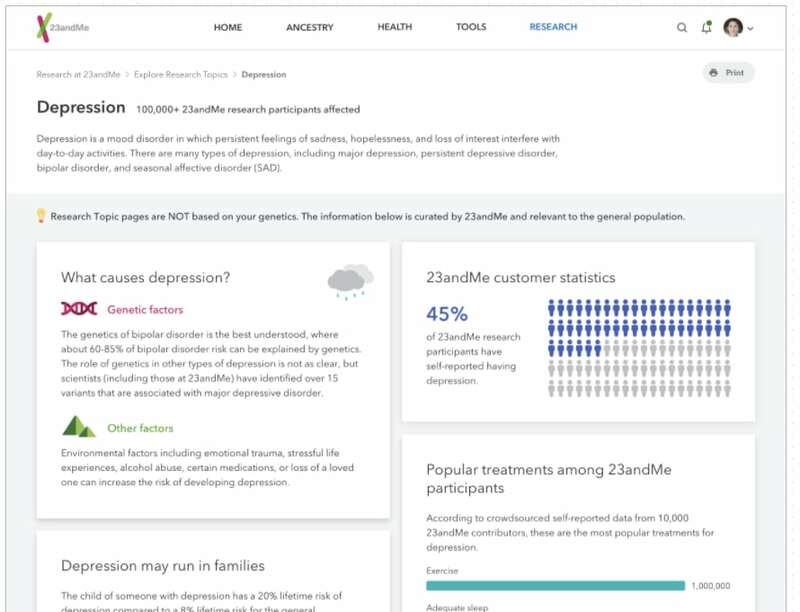 Each condition page includes scientifically curated information describing the condition, its genetic and non-genetic influences, as well as how common it is in 23andMe research participants. The treatment section summarizes what 23andMe customers with these conditions say works or does not work in treating their condition. This kind of crowd-sourced tool allows individuals with say, depression, to see what other customers say is effective or not effective in treating the condition. This offers people a different kind of information than they could get simply by doing a Google search, because it comes from others like them living with the same conditions. Since rolling out the treatment pages over the past few weeks, thousands of people have already contributed over 30,000 personal reviews of their responses to different treatments. This is allowing people to build communities that share common conditions but have different strategies for dealing with them. At 23andMe, we believe in helping our customers manage their health — not just through genetic reports, but also by giving them access to lots of useful, relevant information. This is the first time we’ve enabled customers to share real-time health information with one another. For example, you can see here the most effective treatments for depression reported by 23andMe customers. These include therapy, exercise, and antidepressants such as Zoloft and Wellbutrin. You can also see what treatments could potentially lead to worse outcomes. For example, based on the data shared for asthma, inhalers were among the most used and most effective treatment, but they also included some cases where the symptoms got worse. However, “avoiding allergens” was a relatively effective approach without any potential negative effects. Many treatments are designed for the average patient in mind, but few of us are actually average. We are each unique, and understanding those differences — even small ones — is essential to learn how to better treat conditions and make medical care more personalized. Genetics certainly offers important insight into how we differ in response to treatments. Allowing people to have a place to share their own experience will also aid in our understanding. For now, the purpose of these pages is to share this crowdsourced information on the effectiveness of treatments. But the information could at some people aid in research into how people of different ethnicities or different genetic makeups respond differently to treatments.